Atari introduced the CX50 Keyboard Controller in June 1978, along with two games that required it: Codebreaker and Hunt & Score. The similar, but simpler, CX23 Kid's Controller was released later for a series of games aimed at a younger audience games. The CX22 Trak-Ball controller was announced in January 1983 and was compatible with the Atari 8-bit family. The Atari VCS on display at " The Art of Video Games" exhibit at the Smithsonian American Art Museum in 2012. Games shown include Pac-Man (top), Space Invaders, Pitfall!, and Combat. ^ "A Brief History of Game Console Warfare | BusinessWeek". 2007-05-09. Retrieved 2018-10-13. ^ Arceneaux, Noah (19 February 2010). "Review Article: Game theories, technologies and techniques of play". New Media & Society. 12 (1): 161–166. doi:10.1177/1461444809350996. 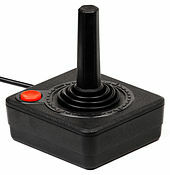 ^ "AtariAge - Atari 2600 - Controllers - Remote Control Joysticks". atariage.com. Retrieved 2019-02-18. ^ "AtariAge - Atari 2600 - Controllers - Kid's Controller". atariage.com. Retrieved 2019-02-18. ^ "The Atari CX-2000 Prototype". 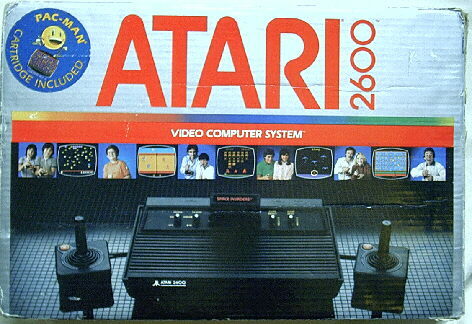 www.atarimuseum.com. Retrieved 2019-02-18. 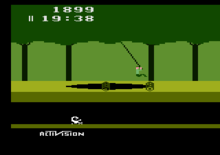 This page is based on the Wikipedia article Atari 2600; it is used under the Creative Commons Attribution-ShareAlike 3.0 Unported License (CC-BY-SA). You may redistribute it, verbatim or modified, providing that you comply with the terms of the CC-BY-SA.